Dogs in the wild grow up in packs and they are socialized almost from birth. A dog becomes socialized by interacting with other canines and learning their verbal cues and body language. The boundaries in the pack are very clear and each pup learns to understand their elders or get thrown out. Domestic dogs also begin socialization in their litter and when they come into a human family, socialization with humans begin. The initial socialization period of a dog is four to 12 weeks. It is during this time that social skills are imprinted on them and their interaction with other dogs and humans is, hopefully, positive. The socialization then should continue into adulthood. But many dog owners choose to adopt older dogs who sometimes were not socialized during this time. So, how do you go about socializing adult dogs? Do you need dog training classes to socialize them, or is it a combination of different factors? When a dog owner brings an adult dog into their home, it’s important to find out early on how socialized he is. His initial interaction with you will be telling – is he fearful or aggressive? Does he back away when you approach or send warning signals such as raised hackles? When you take him on walks, is he nervous around different sounds and sights? Does he shy away from people or other dogs? If you see any of these signs, it’s likely he was not socialized well in his early days. But there are several things you can do about socializing adult dogs with other dogs and humans. A senior dog. Photography by Shutterstock. Go to a dog park but don’t go in. Allow your dog to watch the other pups and observe their behavior. Every time a dog comes near the fence, give your dog a treat. This creates a positive association with other dogs. If your dog reacts aggressively towards the dogs in the park, move further away and slowly move up until he is quiet. When out walking and another dog comes into view, resist jerking on the lead and yelling at your dog. This reinforces seeing other dogs as a negative experience. Instead, distract your dog with a treat or toy, use the command “Watch me!” and praise him when he pays attention to you. Dog obedience class is a great way to help socialize an adult dog before attempting going into dog parks or having playdates. Because your dog is learning commands, he is distracted most of the time. Speak to your trainer about the issue and she can help you introduce your dog slowly to other dogs in the class. This is also a safe place for your dog to learn to interact with other humans. The first step is to socialize your dog with your family. This is best done slowly and patience is a virtue here. Dogs and humans speak a different language so you’ll both be learning how to communicate. When your dog runs to hide from you, don’t go after him and pull him from under the bed. Ignore him and do something that will persuade him to come out like playing with his toys or frying up some bacon. Dogs are curious and social creatures and they’ll eventually become bored and lonely by themselves. Reward him with a bit of that bacon when he comes out. It’s sort of like when your teenager comes down the stairs with an enormous pimple on her forehead. You don’t mention it and act as if there’s nothing wrong. By acting as if your dog’s behavior is no big deal, you’re creating a calmer environment and, thus, a calmer dog. So when he streaks under your legs because the postman is at the door, go on about your business as usual. Only add one person a week at the most into your dog’s life. When they meet your dog, have them offer a treat and speak in a happy, low, encouraging voice. You don’t want to use a high pitch which could excite him. Keep your dog on a leash at first but do not force him to go near the person. Let him take his time. 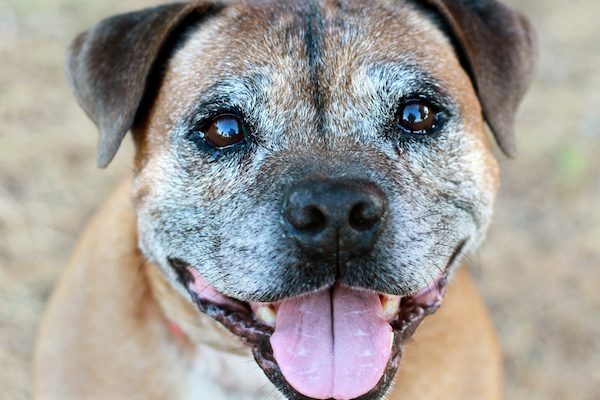 The main thing to remember when socializing older or adult dogs is to be positive and to make each new experience a good one with praise and treats. Corrections do not work well here and will likely will create a more nervous dog. In time, your new companion will become at ease at home and in public and will truly be a member of the family. The post Socializing Adult Dogs Through Dog Training Classes & More appeared first on Dogster.